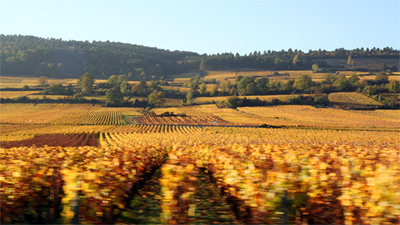 Guest blogger Jeremy Seysses of Domaine Dujac continues his harvest report from Burgundy. On Saturday 23rd September, exactly a month ago, we met with our pickers at 7.30 AM, separated them into two teams, one for me and one for Lilian Robin, our vineyard manager, and set out to the vineyards. We went to Puligny-Montrachet, a white wine only village, while the other team began in the Echezeaux, one of our Grands Crus. As a quick reminder, if I am talking about white wine, the grape varietal is Chardonnay, and if I am talking red, the varietal is Pinot Noir, unless stated otherwise. In Burgundy, most of the differences between the wines of any producer come from the different terroirs, i.e. they are differences due to vineyard location, rather than to things such as blending. We put in a long day of picking as the grapes appeared to be riper than I had anticipated, and picked Bonnes Mares and Charmes-Chambertin as well as the aforementioned vineyards. While having my latte this morning, I suddenly had a craving for biscotti –you know, the proper, porous, Italian kind, with only almonds and not much else? The ones that are so hard they are damn near inedible until dunk into a cup of hot coffee? No, I wasn't thinking of the American Biscotti which -though not nearly as icky as American-style Scones (aka the Doorstop Variety)- are cakey, dense, and can be filled with any number of weirdo ingredients. What's all this stuff about biscotti got to do with this new blog I found? Well, the best biscotti in San Francisco are from this little restaurant called Vivande on Fillmore St. The chef and owner of Vivande is Carlo Middione. I googled his name this morning, hoping to find the recipe for those delicious biscotti of his, but what I found instead was the man had a blog! This post is written by a guest blogger Jeremy Seysses, a wine maker in Burgundy, France. This is the second in the series: A Burgundian Harvest. We've been keeping ourselves busy. The whites are now all in bottle. I'm not very good at having my camera in my pocket at times when I would need it, so again, I have no action shots for you. But I do have a picture of some of the bottles in question. 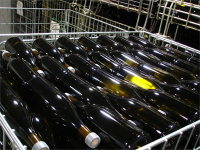 We store our bottles unlabeled in metal crates that can hold 500. The Incredible Shrinking Chowhound: censorship at work again? I was browsing Chowhound last night while waiting for you know who to come home when I came upon a series of very curious looking posts, by someone who called himself 'Photobiker'. This Photobiker dude apparently lives above the popular Yucatan-Vietnamese restaurant Yucatasia -quite beloved amongst the Chow set. Mr.Photobiker is apparently so sick and tired of the unsatinary practices he's observed from his windows above the restaurant's courtyard, he took a bunch of photos to expose those practices and posted them on Chowhound. 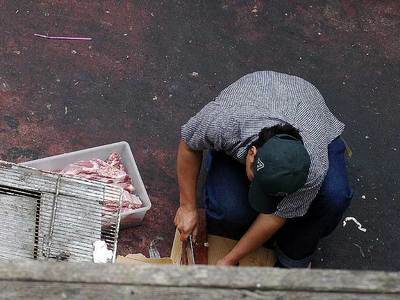 The photos were damning -if they indeed came from the courtyard of said restaurant- showing workers cutting meat on the cement floor with only a tiny piece of wood or a piece of cardboard box as the cutting board, and cooking right next to the overflowing garbage -complete with rats-on-wings pecking happily at the refuse. The tenacious Mr.Photobiker tracked down all the threads in CH that mentioned Yucatasia, and posted a message and a link back to his website. I poked around at the Photobiker's website, and he seems legit enough, a French photographer on a mission to take photographs around the world on his motorbike. There was nothing there to make me suspect that he might be a restaurant owner jealous of Yucatasia's success. Not that I can verify that, but you check out his website yourself and see if you think he's legit too. Miraculously, by the time David came home and I tried to pull up the posts on Chowhound to show him, they've all disappeared, with no note or notation to tell us where they've all gone to. I have to confess something to you. I've never actually done tomato confit before. Many moons ago in Greece, a French neighbour of my friend Rena's gave us the best confit tomato I've ever eaten, so I asked to observe how she did it and took some notes. The process was simple enough, The tomatoes were cut into halves and left to soak in the hot Island sun until completely dry. 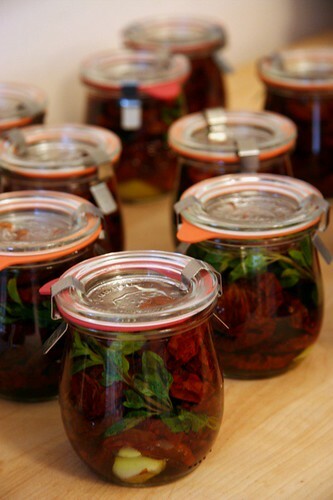 The dried tomato pieces then received a quick dip in a pot of boiling red wine vinegar, then packed into jars and covered with olive oil and a clove of garlic and a bit of herbs. The jars were left alone for a couple of weeks until they were ready to be eaten. So I decided to do this with Joe's beautiful dry-farmed tomatoes this year. I picked up a 20-pound box from Joe and set out to work. What's all clad in red and is coming to town? No, Christmas isn't coming to the City early this year, though if you asked a few chefs in town they might say that's exactly what has just happened to them. I'm talking about the Michelin Guide, that venerable and oh-so-French institution that's been anointing its stars to generations of illustrious chefs, and which has just arrived in our fair city. I don't have much to say about this today. We're heading off to the Michelin release party soon. Check back here tomorrow for my take on what's on and what's off the guide!